The College of the Environment and Life Sciences, (CELS), and the College of Engineering are pleased to invite you to this year's Annual Undergraduate Research Fellows Symposium on Wednesday, December 12, 2018! 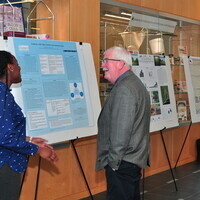 The poster celebration has been a fantastic opportunity for over 65 CELS and Engineering students to showcase their work, and the work of the university community to their peers, faculty and staff. This year we are working again with the Center for Career and Experiential Education, (CCEE), to expand the event’s audience and to share the innovative research with alumni and employers as well. In addition to the Undergraduate Research Fellows Symposium, CELS and CCEE are also partnering to host the College of the Environment and Life Sciences 2nd Annual Career Fair. The career fair will be held just before the Undergraduate Fellows Celebration and will consist of CELS industry-relevant employers looking to host students for internships, research, and to possibly hire for full-time positions. For more information about the CELS Career Fair, please visit: https://web.uri.edu/career/career-fairs/. Our goal is make this event a huge success, and would love your help. If there are employers or alumni that you would like to invite to connect with during the celebration, let us know by emailing Sarah Moseley at sarah_moseley@uri.edu. We would be happy to include them on our invitation to the event. We would also like to invite you to encourage your students to attend the event. For students who are not presenting, this is a wonderful opportunity to expand their network, and learn about the work being done in their respective fields.